Here in the United States it's National Ice Cream Day! As national holidays go, this one is right up there among my favorites. I mean, what's not to love about a holiday that promotes the eating of my of my favorite treats? Sure, my hips might not be too thrilled with the prospect but, for one day, how much harm can a person do? Okay, so maybe I can do a lot (grin) but, hey, I can always diet/exercise/deprive myself tomorrow. Today's a holiday and I intend to indulge. When I was a teen, I helped out at my aunt and uncle's Tastee-Freez one summer and learned to swirl a vanilla cone with the best of them. I also devoured vanilla cones with the best of them. lol! You would think that summer would have turned me off of the delicious treat but it didn't. 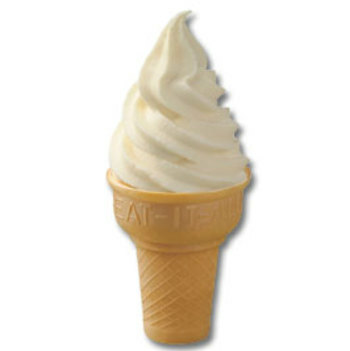 When it comes to cones, vanilla is still my "go to" flavor. While I enjoy the purity of a plain vanilla cone, when it comes to sundaes my motto is the goopier the better. 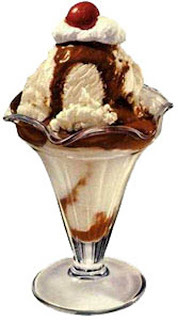 My favorite sundae is hot fudge but there's another - the name escapes me - that DQ offered when I was a kid that I also love. It's vanilla ice cream with hot fudge on one side, caramel topping on the other side and topped with chopped walnuts. I'm salivating just thinking of it! Oh, and speaking of Dairy Queen (DQ), anybody else out there as big a fan of Dilly Bars as I am? Yummy hard shell chocolate covering rich, creamy vanilla ice cream on a stick. Good thing the closest DQ to me these days is 30 miles away or I might be having a fudge-caramel sundae with a Dilly Bar chaser for breakfast! lol! Some people prefer a straw to a spoon when indulging in ice cream delights. For that, I highly recommend a shake from Johnny Rockets. Again, it's a good thing we don't have any close by! While in Florida a couple weeks ago, we had dinner at a Johnny Rockets and the rich, creamy, chocolate shake that I had was just as delightfully delicious as I remembered from the last time I indulged - about ten years ago. My nephew ordered the strawberry (pictured above) and declared it just as good as the chocolate. Of course, being a responsible puppy mom, I can't forget my furkids on these hot July days. What's a great way to help them cool down after a hot romp in the back yard? Frosty Paws! I first discovered these delicious (well, I assume they're delicious though I haven't tried them...and don't plan to anytime soon!) treats more than 17 years ago when we lived in Florida. (Publix is my friend!) My dog was addicted to them. Then we moved to South Carolina where the grocery store managers looked at me like I was one card short of a full deck when I explained what they were. "Ice cream for dogs? Are you sure?" Finally, Publix opened a store 35 miles from us and we were back in business. Yes, that's right. I drove 35 miles to buy frozen "ice cream" for my dog. Hey, have you ever tried to explain to a 95 pound dog why he suddenly can't have his favorite treat? Not pretty, my friends. Not pretty. Thankfully, the rest of the grocery buying world has since caught on and I now pick up Frosty Paws at my local Walmart. Are you going to celebrate National Ice Cream day today? What's your favorite flavor? Waffle cone or regular? 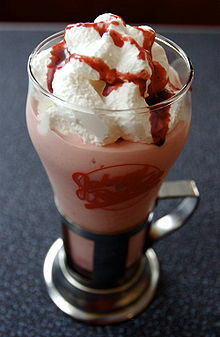 Shake or malt? Bowl or carton? Do you go out for ice cream, buy it at the store or make your own? Frosty Paws for the four-legged members of your family? Let's dish some ice cream! Ice cream!! My downfall!! I love it and if there isn't some in the freezer, I feel as though I need to make an immediate stop at the grocery store. My favorites in order of preference are: Moose Tracks, Coffee, Peppermint and a new discovery: Talenti Gelato Sea Salt Caramel. This is true decadence and you MUST try it!! By the way, while a cone is tasty, I just use a bowl because then can scarf down more ice cream! Oh my gosh, that Talenti Gelato Sea Salt Caramel sounds devine! I just checked out their website and it says two of my local grocery stores carry it. Squeeeeee!!!!! I will have to tell my husband this is National Ice Cream Day. He is a big ice cream fan. I enjoy it and like to sample different flavors. Favorites are Pralines & Cream and raspberry. 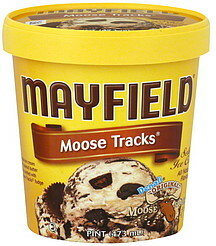 You can usually find a carton of Turtle Tracks or Moose Tracks in our freezer. We have been known to get doggie cones for our four legged friends when we go to the dairy bar. Sugar cone is the option I usually choose unless we are home and I decide to make waffle cones or bowls. I have been known to hide the ice cream from my husband. I can serve a scoop and be content making the carton last a while. My husband has large bowls. We will have a dish one night and when I go back for another a few days later it is gone. Favorite treat when we are out: a hot fudge sunday with whipped cream, nuts, and a cherrie on top. I'm afraid I'm like your husband. I buy a carton with the best of intentions but it keeps calling my name...and I answer! lol! A yummy post, PJ! Home made the old-fashioned way in a hand-turned churn is best IMO--with fresh peaches or strawberries. But store-bought is definitely easier. Blue Bell Pralines and Cream and Mayfield Banana Split are my top choices then. The grands all love ice cream, and so we usually have a carton or two in the freezer plus a non-dairy version for the one who's allergic to milk. Fortunately, they're all purists who prefer chocolate or vanilla, which I find easier to resist. I may splurge today though. It'd be practically unpatriotic not to indulge on National Ice Cream Day, wouldn't it? I definitely go out and by. Don't have the skills or wherewithal to even think about attempting to make it myself, lol. I am one of those who'll eat straight out of the carton. Skip all the preliminaries. You're speaking my language, Lisa! You know, it's strange but as much as I love strawberries (and I do love strawberries), I've never been a fan of strawberry ice cream. I'll dump fresh strawberries over vanilla ice cream but I just don't go crazy over the ice cream that's already made that way. It's new from Talenti and so good! It's soooo worth the search! Hope you find some. Small container and a bit pricey but so delicious! Yeah, she's weird. She doesn't like cake either...except for red velvet. Plain chocolate is my favorite, though I also love cookies & cream and mint chocolate chip. I've heard great things about the new red velvet ice cream, so I must try it SOON as I'm a red velvet-aholic! LOL!